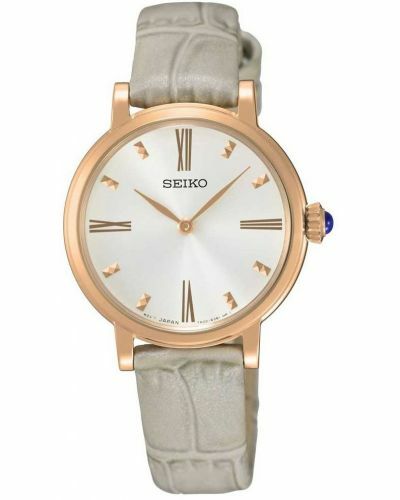 This striking women's watch is brought to you by world renowned Japanese watchmakers Seiko as part of their dress collection. Featuring an elegant 28mm round gold plated stainless steel case and bezel in which houses a crisp white dial with contrasting black Roman numerals and delicate black batons and second hand. Set upon a sophisticated gold PVD plated stainless steel link bracelet and fastened by a fold over closure with push deployment; this stunning watch is both stylish and classic in its design. Powered by Eco-drive/Solar technology this watch will never require a battery change and can be charged through both natural and artifical light. Protected by Hardlex Mineral glass this beautiful watch is water resistant up to 50 meters and comes with a two year guarantee. 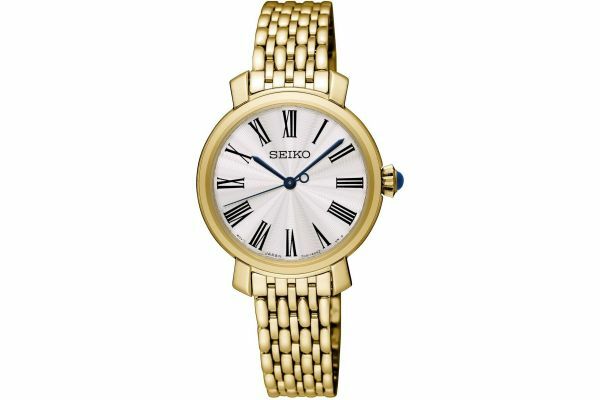 For us to size your new Seiko Ladies watch as accurately as possible, please take a look at our downloadable Watch Sizing Guide.